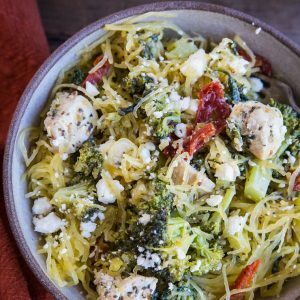 Basil chicken spaghetti squash with broccoli, spinach, sun-dried tomatoes, and feta makes for a comforting yet light dinner. 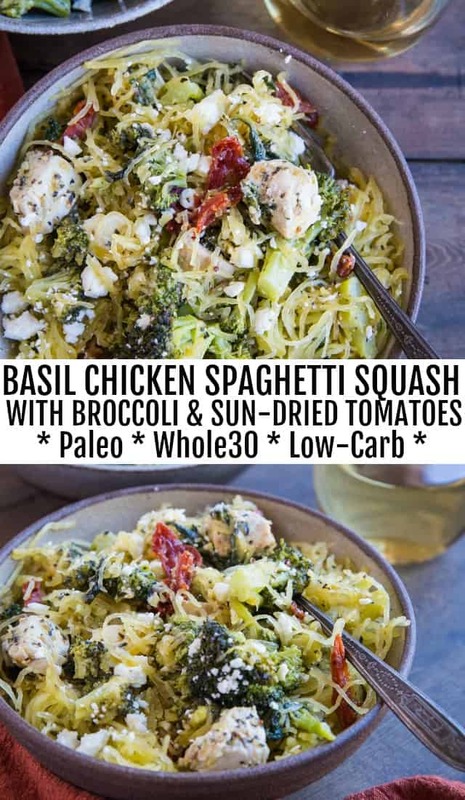 This easy paleo, keto, and whole30-compliant recipe is a great go-to for any night of the week. The best meals are sometimes born from what is already right there in your house. All it takes is a little creative thinking and all of a sudden, a delicious, complete meal takes form. 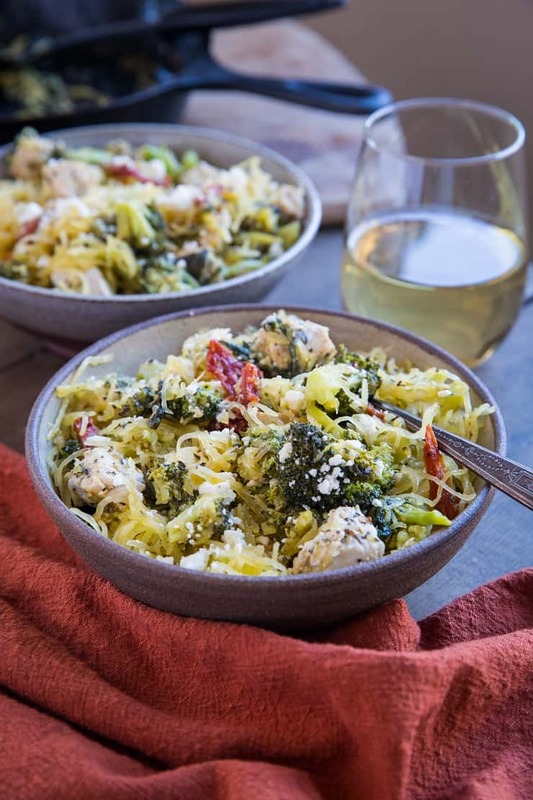 I was inspired to make this basil chicken spaghetti squash for dinner one night because the ingredients were all just sitting right there in my refrigerator, beckoning to me. What started as a refrigerator clean out turned into a household favorite. The best part? One short cooking session yields 3 to 4 meals. The first time I made this basil chicken spaghetti squash, I snapped a photo of it for my Instagram story, and lots of folks expressed interest in seeing the recipe. While this is definitely one of those meals that doesn’t really require a recipe, I always love to provide inspiration for healthy dinners. And this particular meal is just so easy! 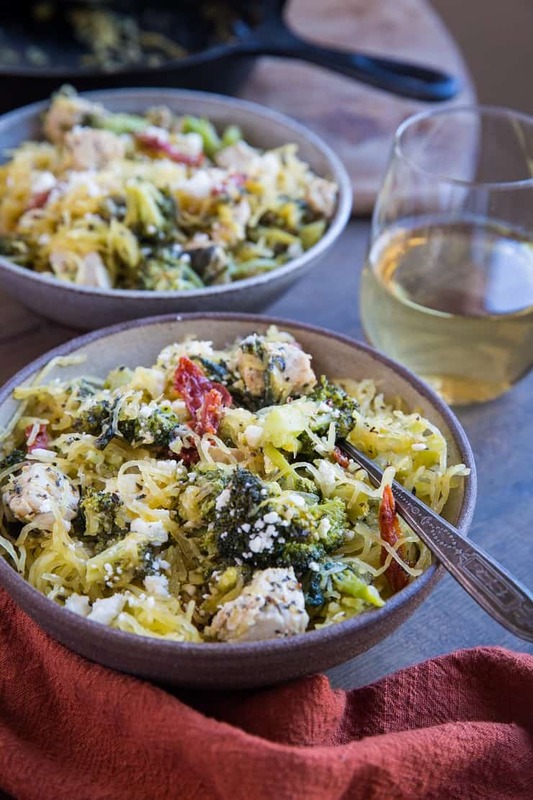 While I made this basil chicken spaghetti squash by sheer accident on the first go-round, I have since made it multiple times. The macro breakdown is pretty great, it’s full of a variety of nutrients, and it’s easy to throw together on a whim. Plus: yum!! The only thing that requires time is roasting the spaghetti squash. Thankfully, this step can be done ahead of time when you’re able to anticipate making this meal! The three main sources of flavor in this recipe are feta cheese, sun-dried tomatoes, and stone ground mustard. That’s right, mustard! I know it may seem strange, but the briny, tangy flavor of stone ground mustard gives the spaghetti squash a lot of added flavor, and I promise it doesn’t make your dinner taste like a sandwich. Add in your favorite seasonal vegetables such as kale, butternut squash, mushrooms, zucchini, carrots, bell peppers, etc. If you don’t have mustard on hand, use cider vinegar, kalamata olives, or additional sun-dried tomatoes. Or simply leave it out and the meal will still be plenty flavorful. You can swap stone ground with whole grain mustard, or even use spicy brown (see recipe notes). 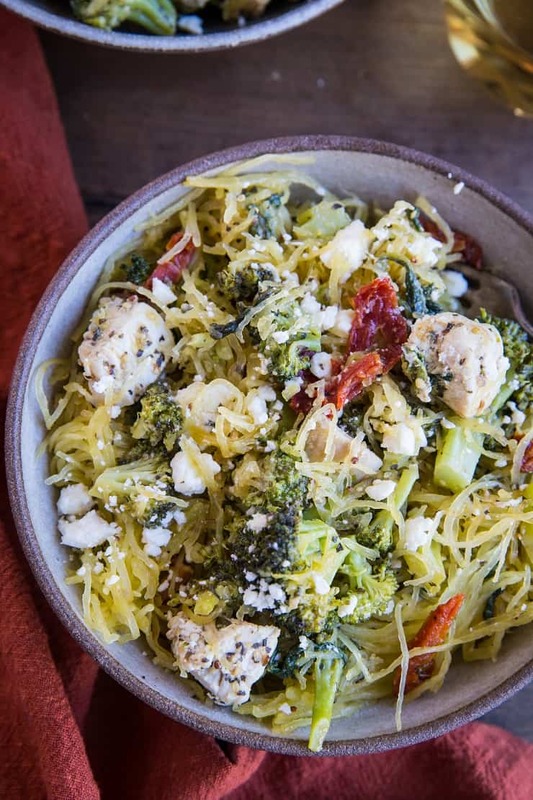 Omit the feta cheese to keep this meal dairy-free. Add in some fresh basil or drizzle the whole thing with pesto sauce. Omit the chicken and add your favorite plant-based protein (such as chickpeas) to make this a meatless meal. Roast the spaghetti squash up to 5 days in advance. Make the whole recipe up to 3 days ahead of time. Cheers to simple, fresh, easy meals! Roast the spaghetti squash using these instructions. While the squash is roasting, prepare the rest of the recipe. Heat the avocado oil in a large skillet over medium-high heat. Add the broccoli, stir, and cover. Cook 2 minutes, or until broccoli is bright green. Add the chicken, stir, cover, and cook another 3 minutes. Remove lid and add spinach, sun-dried tomatoes, ground mustard, and dried basil. Stir well and replace cover. Continue cooking until chicken has cooked through. Remove cover and cook until much of the liquid has burned off. 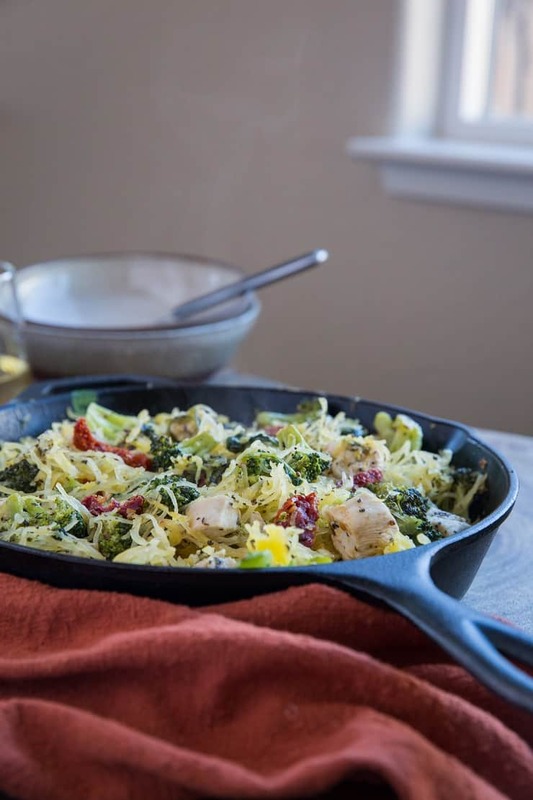 Add the spaghetti squash strands to the skillet with the chicken and vegetables and stir well until combined. Sprinkle with sea salt and add the feta cheese crumbles and stir well. 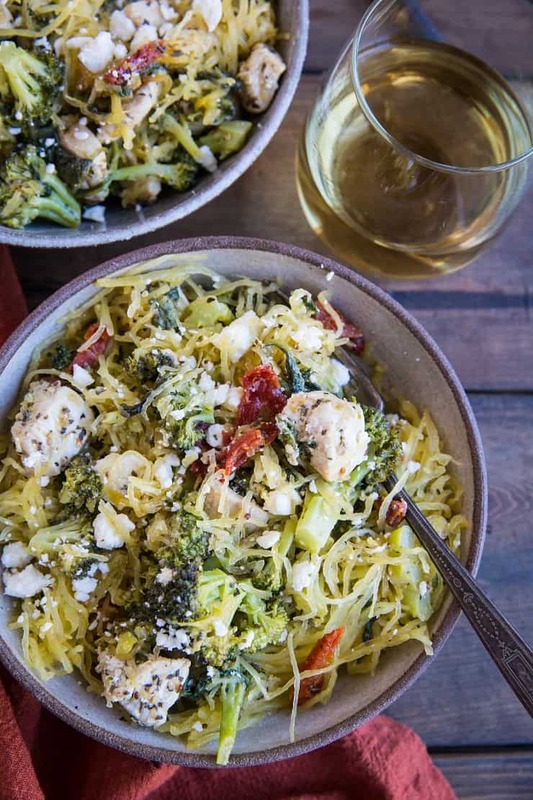 Taste spaghetti squash for flavor and add more sea salt and/or mustard to taste. Serve heaping portions in bowls and enjoy.